I’m sure none of these people are actually trying to talk us out of having another baby. (It’s too late now, anyway!) They’re probably just trying to give a friendly warning about what’s to come. Or maybe they’re simply making conversation. I don’t know. But I get that it’s going to be hard. I’m under no misapprehension that this is going to be a walk in the park. Believe me. It’s actually something I think about all the time. I worry about how we’re going to take care of everyone when we’re outnumbered. I worry about how I’m going to wrangle more kids than I have hands. I worry about how I will adjust to the new routine of three children. I worry about the effects it will have on my sanity. I worry that I won’t be able to handle it. I worry about all these things. So, believe me when I say I didn’t make this decision lightly. 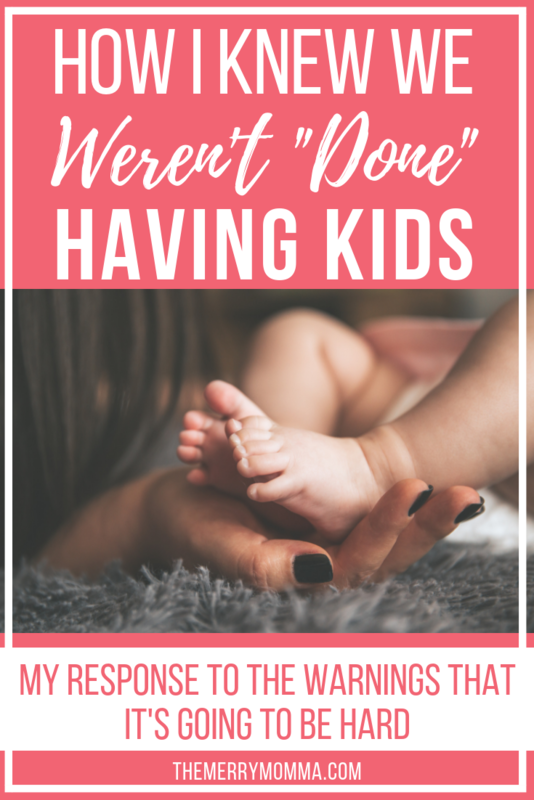 Even though I know it’s going to be hard, even though I doubt my abilities as a mom, even though I question whether I’m the type of mom that can handle more than two kids (sometimes I question whether I can handle two! ), I’m sure of one thing. There is a desire — a stirring, really — in my heart to have more children and raise them for the Lord. And I know it’s not from me. 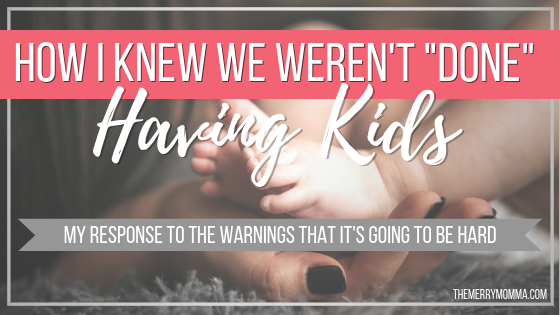 Because there was a time, as I have often shared on The Merry Momma, when I wasn’t even sure I wanted to have kids. But God eventually gave me a vision for motherhood (or, rather, I finally listened! ), and I’ve never been the same since. That’s how I know this is a calling from God and not a personal whim. And you know what most (actually, I’m 99% sure it’s all) callings from God have in common? They involve doing hard things. They stretch us outside our comfort zones. They require strength and abilities beyond what we naturally possess. They lead other people to ask whether we know what we’re doing. They lead us to ask ourselves whether we know what we’re doing. But difficulty has never been a reason to shy away from things God is calling us to do. Being unsure of ourselves and our resources hasn’t either. Because whatever He calls us to do, He enables us to do. ALERT ALERT! Before I say one more word, however, let me be perfectly clear — I am not suggesting that every family is supposed to have lots of kids. God’s plans are as diverse as they are perfect, and we cannot (and should not) dictate what is “right” for any family other than our own. I’m only speaking for myself here. And I knew I wasn’t done after two. Not because I thought it would be fun to have another baby. Certainly not because I’m naturally gifted at being a mother! But because this third baby was something God placed in my heart. I knew it was something I was supposed to do. Even though I knew it was going to be hard. Because the best things from God usually are. Thank you!! I have a lot of kids and 4 of them in my home at the moment. People always have a lot of thoughts on my decision to have as many children as I have and it’s usually not good and it makes me start to doubt myself and my decision. However there were a few wise women brought into my life and they told me exactly what you wrote in this article, that the Lord has plans for me and it involves raising alot of children lol and that he never gives us more then we can handle and that what ever we need so I can support these children-he will make sure we have it! So for the past three years as number 5 and 6 came Into this world we have had many days that I could scream but we’ve had so much joy and laughter and happiness that it over compensated for the hard days. Those hard days were meant to bring me closer to the Lord and to learn to pray more and seak out the Lord in trying times!! Perfect topic thank you!! Thank you. This spoke to my heart in a vey full sense. Thank you for putting into words what I could not.